A couple of weeks ago I was invited along to the YO! 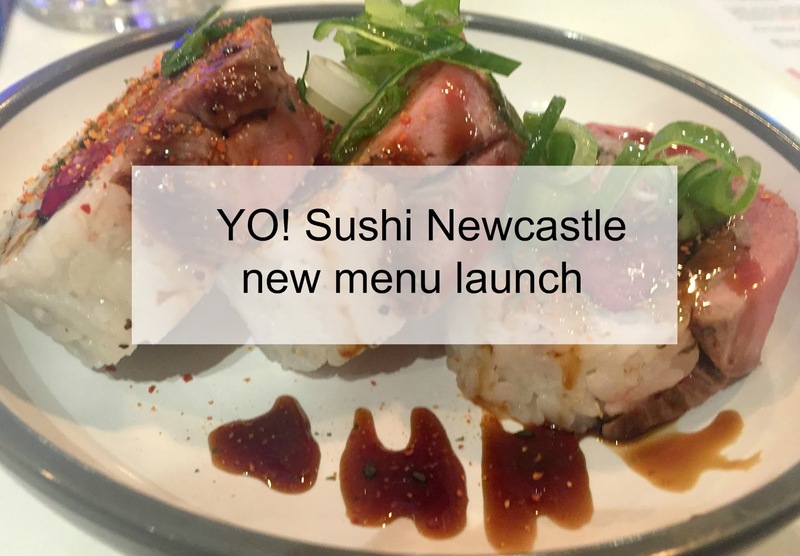 Sushi Newcastle new menu launch, as we have been away on holiday this post is a bit late, but better late than never. I love sushi but I have never actually been to YO! Sushi before, I have walked past the Grainger street branch in Newcastle so many times since it opened and we always say we will have to try it someday. So when an invite, inviting me along to the new menu launch landed in my inbox I thought it was the perfect opportunity to see what it was like. Situated on Grainger street, near Monument in Newcastle city centre you will find YO! Sushi, I arrived early and was warmly greeted by the staff and shown to a seat and handed a glass of prosecco - always a good start. 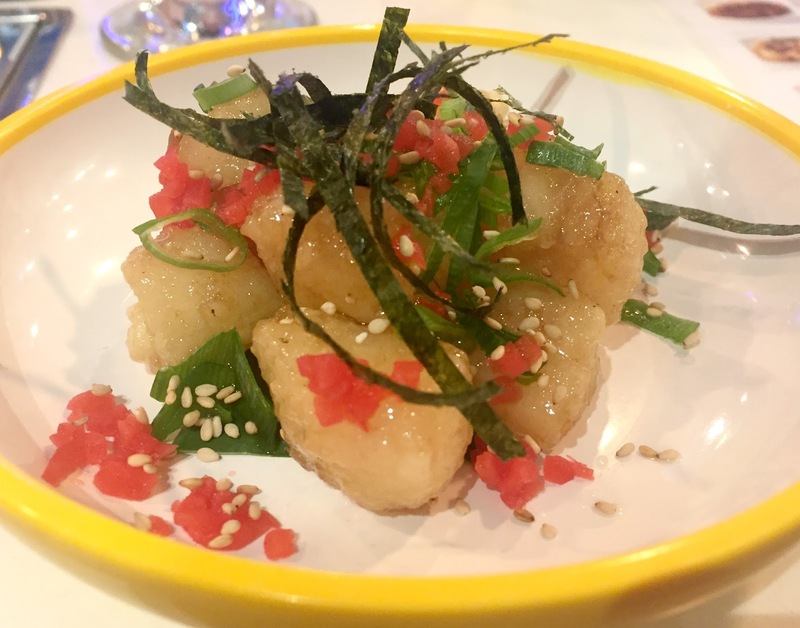 Myself and a group of bloggers were invited along to try out the new 2017 menu, hear about the dishes and enjoy lots of yummy food and drinks. So what did we sample from the new menu? This dish surprised me as it was not at all what I was expecting, it was basically katsu chicken in a white crustless bread sandwich. 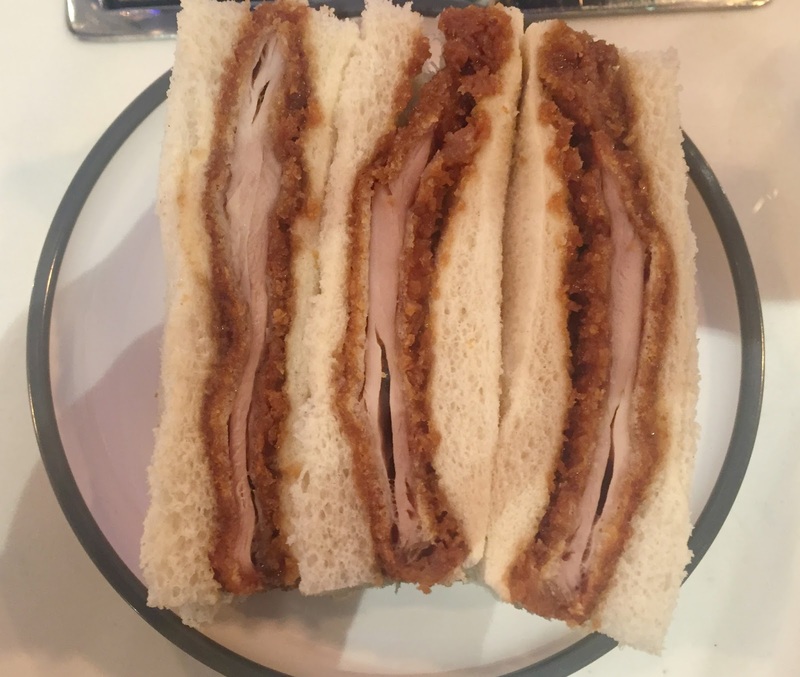 Described as 'succulent chicken thigh coated in panko crumbs and fried to a perfect crisp, covered in Tonkatsu sauce and nestled between soft white bread and finished with Japanese mustard.' It did taste nice, the chicken was crispy and the Tonkatsu sauce tasted amazing with the Japanese mustard giving it a kick. However, I am not a fan of mustard so that kind of put me off this dish, I know that my other half would love something like this though. 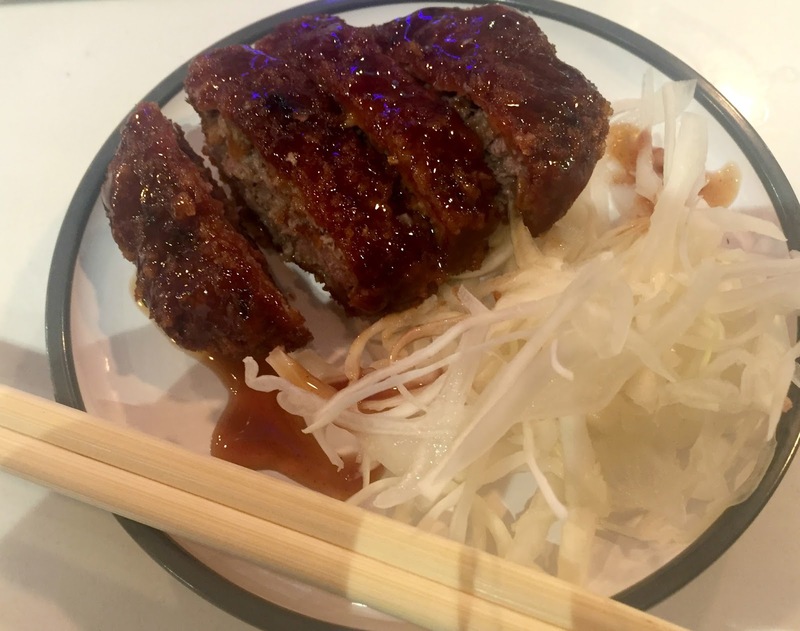 I really liked this dish which is described as 'Seasoned minced beef in a crispy Panko crumb, fried until golden and topped with a drizzle of fruity Tonkatsu sauce.' This dish came with a side of white cabbage which worked well with the meaty flavours, I really enjoyed this dish although it did slightly remind me of burgers. The fruity katsu sauce and the beef worked so well together and this is a dish that I would probably order again. I really recommend this dish which is 'Fresh pieces of cod, fried until crisp and dipped in tangy "Nanban" sauce.' It was delicious the cod was really crisp on the outside and tender and meaty on the inside, the sweet and sour sauce was the nicest I have tasted and worked so well with the cod giving it a nice tangy taste. 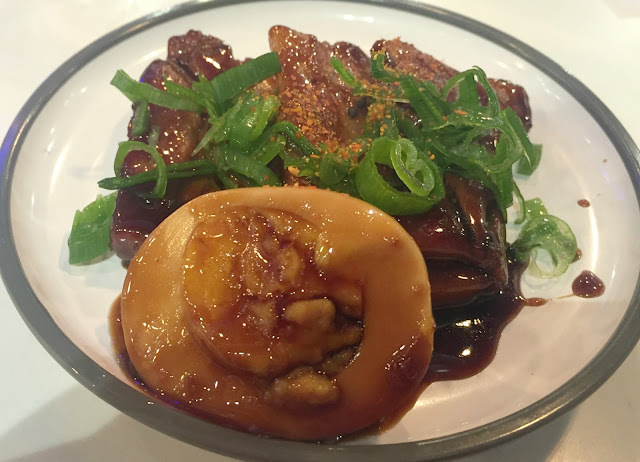 Another dish which I really enjoyed and recommend which is 'Tender slices of pork belly served in a sweet and salty teriyaki glaze, served with a boiled egg.' The pork melted in my mouth and was so tender, the teriyaki glaze was delicious and not too sweet. I could happily have eaten more of this dish as it was so moreish. I am not a fan of squid at all, so this dish did not appeal to me especially as it had smoky bonito flakes on which kept moving and it made the dish look like it was alive. It was not 'alive' at all it was just the flakes moving due to the heat of the cooked squid. 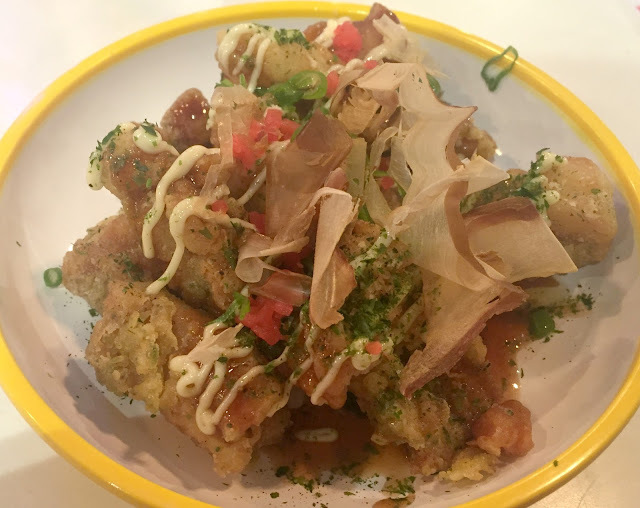 You get a generous portion of Osaka-Style Squid which is 'Made from 100% responsibly sourced squid which is fried crispy. With smoky bonito flakes, aonori, beni shoga, mayonnaise and tonkatsu for a tasty finish'. Without a doubt, this was my favourite dish of the evening 'Tender beef wrapped around fresh, homemade tsukemon pickles and a dusting of shichimi powder for added kick'. The beef was cooked rare and had a nice tang to it, the only downside was that they fell to bits when eating them so I could not try everything in the roll together. I would still get them again though as they were so good and made a nice change from fish based sushi rolls. 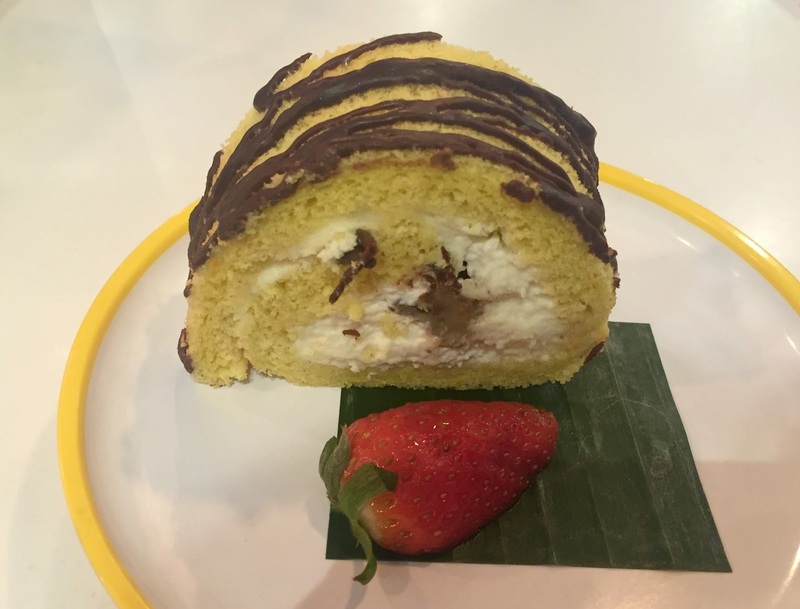 Finally, for dessert, we were served a banana cake 'Fresh cream swirled into a banana sponge topped with chocolate'. By this point I was really full from all the food we had tried so I did not manage to eat all my Tokyo banana cake, it was nice enough with just a hint of banana and lots of cream but I think I was probably expecting something a little more special after the delicious mains we had tried. Overall I was really impressed with my first visit to YO! Sushi, the food was delicious and the staff were so welcoming and helpful. 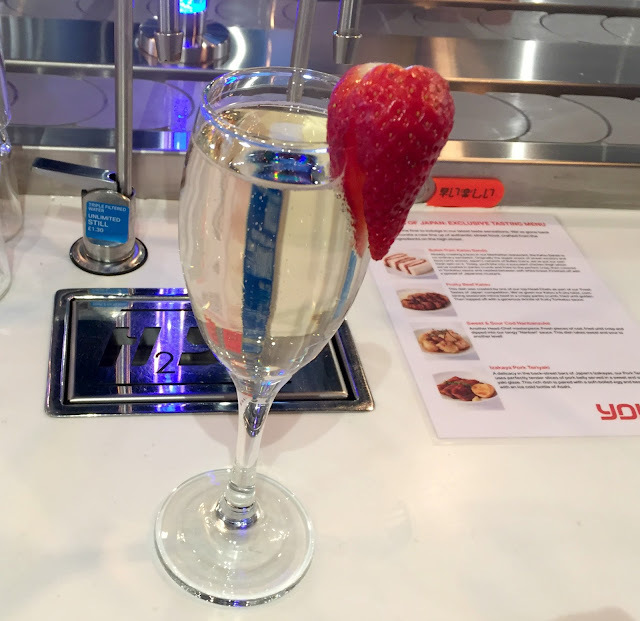 I know it was a PR event but the staff were so knowledgeable about the dishes and explained what everything was and answered questions, they also kept drinks topped up and provided brilliant service throughout the evening. The standout dishes for me were the Seared Beef & Pickle Rolls, Izakaya Pork Teriyaki and the Sweet & Sour Cod Nanbanzuke. I am already planning on returning to YO! Sushi so that I can try these dishes again as I enjoyed them that much. My teen is a huge sushi fan and I just know that she will enjoy trying new dishes and the whole YO! Sushi experience too. If you have visited YO! Sushi before let me know what dishes you recommend. You can read all about Yo! Sushi Ninja cooking school that blogger My Gorgeous Boys attended. Disclosure I was invited to this event and received complimentary food and drinks for the purpose of this post. However, all opinions and photos are my own. Oh now I really like the sound of the squid - yum! I love Yo Sushi and they sound like they've added some fab new options I'll have to check them out soon! These new editions look delicious, i reckon its time to head to yo sushi! Yo sushi is somewhere i never think of going as the amount of dishes we eat the price quickly racks up! It's good to know the food and service was good though. I'm sure the girls would have fun with that conveyor belt! Mmm my mouth is watering - just love Japanese food! Woah! You are making me very hungry indeed. What a lot of lovely looking dishes. Not all are raw either which suits me lol. Although I am a big fan of Sushi. I lived in France for 14 years and they are really into Sushi. What a treat. I like a York Sushi from time to time. The banana cake looks lush. Regretfully I never got a chance to eat at Yo Sushi before we left the UK. I really like the sound of the seared beef and cod dishes and would LOVE to try the banana cake! I'll have to make it a must visit when I'm back! I love Yo Sushi. I think the food they serve is so delicious and healthy. 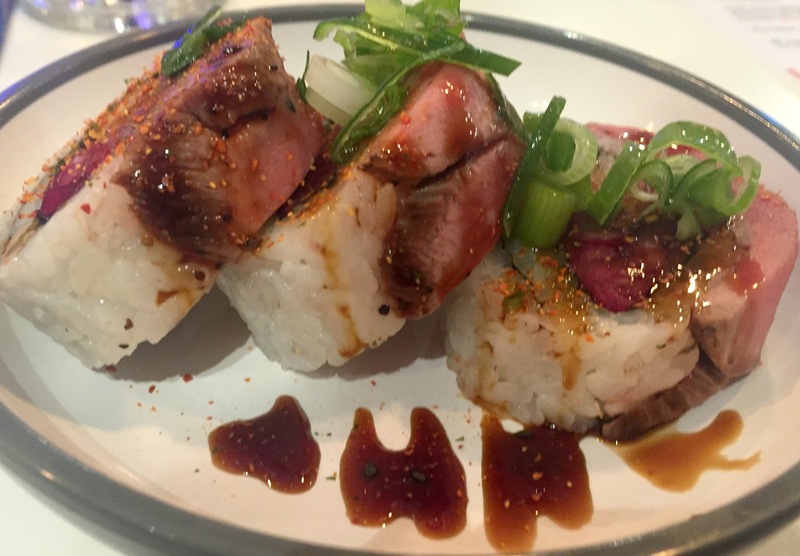 I have always liked the seared beef & pickle roll and it’s one of our favourites when we visit the YO! Sushi. The Tokyo banana cake looks really yummy. I've never been to Yo Sushi, because I don't like sushi, but I had no idea they made such lovely alternatives too! YUM! I will need to give the new menu a try. Luckily I work right next to one. The beef and pickle roll looks so good. I usually just devour plates of the katsu so would be good to try new stuff haha! I've never been to Yo Sushi because it's always full in Southampton! I'd love to try that fruity katsu though! The banana cake looks good!! I've never been to Yo Sushi! This is one place I've never been but my husband keeps nagging me to go! What were the vegetarian options like?